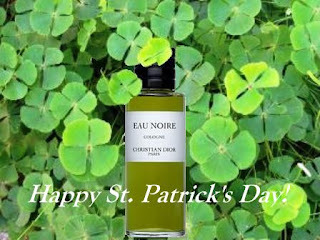 Perfume-Smellin' Things Perfume Blog: Happy St. Patrick's Day! In honor of St. Patrick's day ... I bought you some jewelry for our upcoming wedding anniversary ... that will turn your skin green according to the salesman. How cool is that? I'll answer to that with an old Irish proverb: "The mills of Colombina grind slowly but they grind finely." You two are a riot! One year for my birthday, my uncle made me a bracelet that not only turned my arm green and broke me out, but smelled funky! It turned out that I have an allergy to nickel silver. The next year he pierced my ear with a wire and a potato...long story. Wonder what he is going to do this year???? I am wearing Premier Figuier in celebration of the Holiday.